Better Care Together ‘Engagement’ meetings taking place in February & March on the future of Community Health Services. There will be two more, so please try to go to one if you have not yet been – Tuesday 5th march and Wed 6th March. Wednesday, 29 March 2017, 5:30 pm. A Special Meeting of Health and Wellbeing Scrutiny Commission has been arranged for Wednesday, 29 March 2017, 5:30 pm. in Meeting Room G.01, Ground Floor, City Hall, 115 Charles Street, Leicester, LE1 1FZ. The meeting will consider submissions from the public, patients groups and other interested community organisations on their views on the Draft STP. Leicester City Council Full meeting. 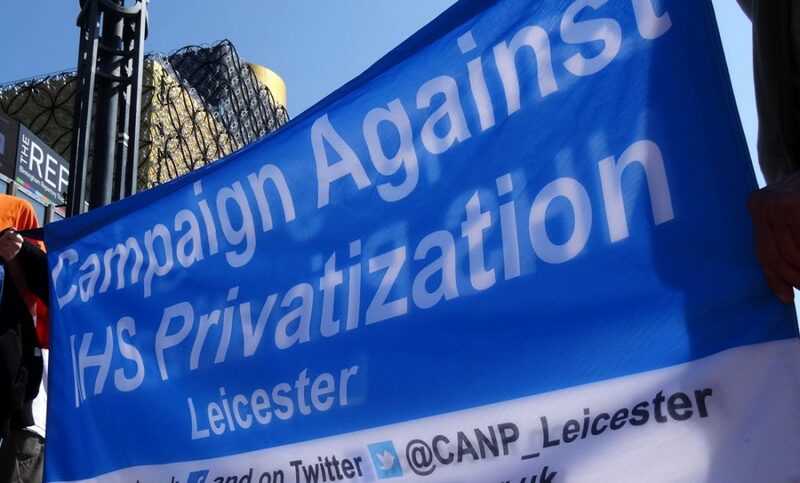 CANP mounted a demonstration ahead of the Leicester City Council scrutiny meeting on the Sustainability and Transformation Plan. CANP had been calling fo effective scrutiny since January 2015 but had found it difficult to input into these meetings. Patients and members of the public in Leicester are invited to attend an event where information will be shared about plans to change health services over the next five years. Leicester City Clinical Commissioning Group is hosting a public information event so the draft plans for the local Sustainability and Transformation Plan (STP) can be clearly explained to local people, patients and carers. The meeting will take place on Thursday 23 February, 2017 between 6pm and 8pm at the Peepul Centre, Orchardson Avenue, Leicester, LE4 6DP. People in Leicester City are living longer, and more frequently with one or more long-term health conditions, which means they need to use health services more often. Local health organisations are responding to this increased demand for care within the budgets that are available, but they will no longer be able to do so if this trend continues. The draft plan, which is called Better Care Together locally, sets out the action needed to ensure consistently good quality health services can be delivered to patients for many years to come. Plans like these are being produced in all areas of the country. Later in the year patients, carers and members of the public will be invited to take part in a consultation about the proposed changes to health and social care services. The purpose of this event is to make sure they understand the plans well enough to help them to take part in the consultation and express their views when the time comes. The draft plan is available to view by going to the end of the page at https://www.leicestercityccg.nhs.uk/about-us/strategies-and-reports/ and has been drawn up by health and care organisations from across the region. Please let us know in advance if you have any access or disability requirements. East Leicestershire and Rutland CCG are organising 2 meetings about the future provision of health care in Lutterworth at the Wycliffe Rooms, George Street, Lutterworth, Leicestershire, LE17 4ED. The first will take place on Monday 9 January 2017 from 12pm to 3pm and the second on Tuesday 24 January from 6pm to 8.30pm. To register please call 0116 295 3405 and ask for the communications team. Alternatively email: communications@eastleicestershireandrutlandccg.nhs.uk. Another major reorganisation is being imposed on the NHS in Leicester, Leicestershire and Rutland, this time to shrink the service following the government’s policy to fund the NHS below the level of rising need. 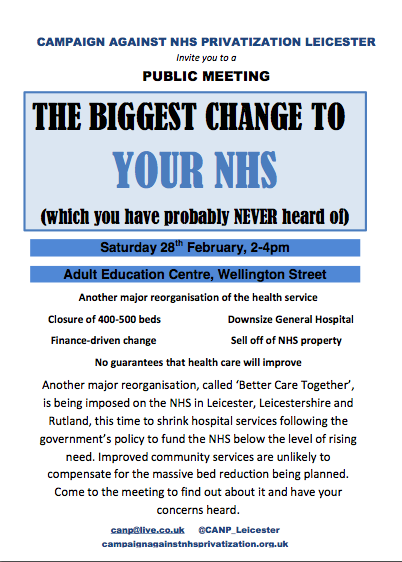 Improved community services are unlikely to compensate for the massive bed reduction being planned with between 1/5 and 1/3 of beds to be closed. All areas of the country are being asked to produce a Sustainability and Transformation Plan (STP) in order to shrink the health service into the smaller budget available under the current government. Sustainability and Transformation Plans pose a significant threat to the quality of care we will be able to access in the NHS. Despite this, they are being discussed in conditions of total secrecy without democratic process and public accountability. Please write a letter of concern to your councillors and your MP. We are in the Leicester, Leicestershire and Rutland area (called ‘footprint number 15’). Ask your MP and councillors what actions they are taking to insist the STP is brought into the public domain and subjected to proper democratic processes, including effective scrutiny. Some or all of the following points can be made. Please try to put these in your own words. Despite the serious and potentially dangerous consequences of Sustainability and Transformation Plans, they are being written and discussed in secret with no effective scrutiny and no discussion with the public. In other words, they are completely undemocratic. The STPs are largely financially driven. They threaten the long term adequacy of the service by making dangerous cuts for short-term financial reasons. Sustainability and Transformation Plans are the method being used to force the health service to shrink because the inadequate funding received by the health service in recent years is now cutting deep into the fabric of the service. The service has been building in greater efficiency in recent years to try to cope with the slide in funding but now radical and potentially dangerous cuts are being considered. The Sustainability and Transformation Plans affect the whole service and involve even more restructuring and reorganisation of the service. Many elements of the STPs have no adequate evidence base and run the risk of both jeopardising the quality and safety of patient care and not working in terms of either saving money or reducing pressure on the hospitals. In LLR, hundreds of acute hospital beds are threatened with closure even though our local hospital trust (University Hospitals of Leicester) already has too few beds in comparison with the number of people requiring admission. ‘Transforming’ the service means placing more pressure on families to care for their own sick relatives and neighbours at home. Extra reliance on social care means more families faced with charges as social care is means tested. More unpaid volunteers will also be used instead of paid and qualified staff. Families are likely to come under more pressure just at a time when there is a huge shortage of free social care because of the underfunding of local authorities. This restructuring indicates the government does not wish the health service to carry on in its current form. By shrinking and restructuring the service, the government is creating space for the acceleration of privatisation. Low levels of NHS funding cannot be justified on the grounds of deficit reduction as additional spending on health results in even more economic growth which more than cancels out the cost of the original additional spending. The NHS is an important part of the economy as well as an important part of the quality of our lives. We should not just accept the shrinkage and deformation of the health service. We should fight it!